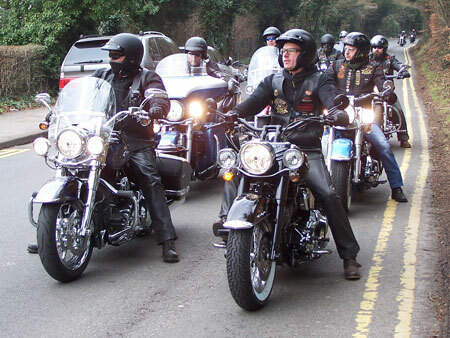 Where do you take an unknown number of Harley riders, on a day when the weather may be completely unpredictable? We needed a destination that could comfortably accept 50 plus people (numbers not age!) as well as a refreshment stop on route that wouldn’t baulk at a Chapter arriving within a few minutes. Add to that the requirement for a mixture of roads which were amenable to our second rider drop-off system (i.e. not double red lines under CCTV cameras) but still interesting. Hence we decided to go to Brighton via Ryka’s, the legendary bikers’ café at the foot of Box Hill. We actually passed Tattenham Corner, from where JW is due to depart at 08:45 on 18th March on the 1914 Harley-Davidson single, be there! Fortuitously we had already decided to exit London via Wandsworth Bridge rather than Putney, as it was closed on the morning of the run due to what the media quaintly describe as a ‘police incident’. The two previous recces of the route had shown that the road-works in the Wandsworth one-way system were sufficiently advanced not to pose any great problems, and it got us onto the fabled A3 as quickly as possible to escape the rat-race. If anything the road-works in Brighton were far worse, which proved to be the case on the day. Robin Lahiri and I also forced ourselves to eat seaside fish and chips to make sure it would pass muster, as well as a Ryka’s bacon butty (thanks, Les). The only thing the recces lacked was decent weather, both were more or less inclement (wet/cold/foggy). We did identify that we needed one junction marked by a Road Captain, the turn-off from the A3 onto the A240, as if we missed that one were going to Portsmouth to see HMS Victory instead! So we knew where we were going, where the drop-offs would be placed, the timings had been checked, and we knew that we wouldn’t need a fuel stop (65 miles maximum). All that was left in the ‘unknown’ tray was what the weather would be like on the day, and who would turn up. It was indeed rather easier to check off the absentees, as by 09:15 we had over 55 bikes at Warr’s, including nine Chapter Officers. 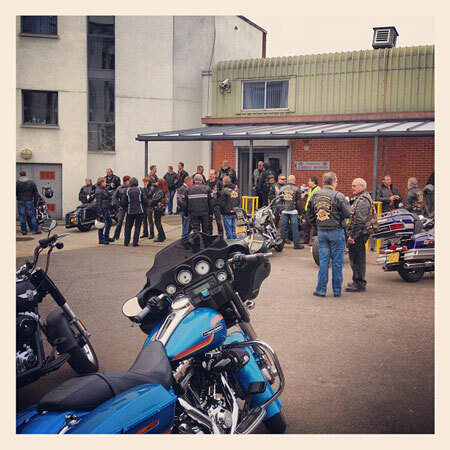 Four more bikes and riders would meet us at Ryka’s (by prior arrangement) so nearly 60 Harleys arrived in Brighton. Advancing years means that I’ve now got to have notes for the briefing, and with so many other Road Captains present I felt like I was under examination... so make sure you’re funny! From the shade of JW’s new portico (verandah, loggia, gazebo?) I regaled the assembled throng for 10 minutes, reminding them of the use of staggered formation, the roles on the day of the various road captains and the vital importance of maintaining a drop-off until collected by the Last Man. The route was simple - A3 to the Tolworth Tower junction, A240 to Drift Bridge, turning right for Epsom Downs, then some twiddly back roads through Headley to Ryka’s at Box Hill. After a tea stop we then went down the A24 until just past the A272 (worth avoiding on a Sunday unless you’re a paramedic) then turned left back on to country lanes as far as the A281, which we followed until it met the A23, and so into Brighton. Leaving Warr’s at 10.15am, we got to Ryka’s at 11.15am, leaving at 11.50. 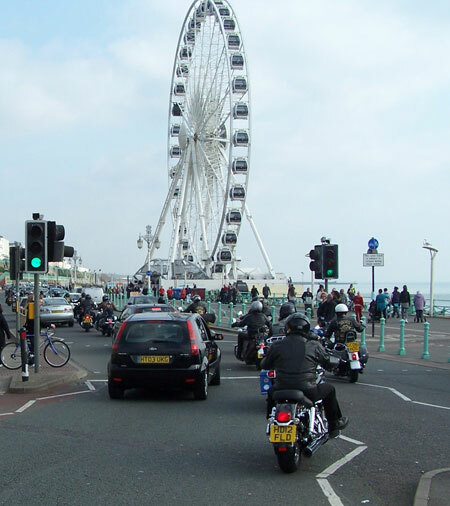 1.15pm saw the Last Man arrive at Madeira Drive, whereupon we all parked up along the sea front and went off for lunch. The weather had come up trumps for once and it was a lovely sunny Spring afternoon. The route home was either the simple A23/M23/M25 or one of the more scenic alternatives. Les, Guy and I went along the seafront road to pick up the A283 past Shoreham to get back onto the A24, but I’m sure that there were many other enjoyable alternatives. Thanks to - Rob Warr for opening the shop and providing breakfast; Robin, Les and Andrew for Road Captains’ duties; and to all the drop-offs who stayed where they were put ensuring that the ride-out went smoothly for all. Next outing is May 13th for Raw-Hide Ride 2, which will be a blast.